#4 Bishop of Nola (5-1) – Johnny V in the irons for Bruce Brown. 2/2 at Saratoga, and makes a switch from Castellano to Velasquez. #6 J L Bernstein (8-1) - Rajiv Maragh for Schettino, and is 2/2 ITM over this oval. Both of his last races at this level show promise. #8 Abilo (9-2) - Very speedy son of Pioneering, and Channing Hill is up for turf queen Linda Rice (24%). 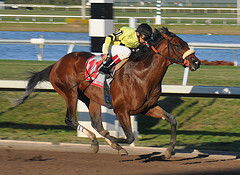 # 10 Saginaw (6-1) – J.J Castellano in the irons, and he made a jump off of Bishop of Nola to ride. He must believe he has a shot, and is riding for the red-hot trainer Chad Brown (35%). #1 & 1A Vineyard Haven/Girolamo (2-1) – A powerhouse entry for Bin Suroor (30%) and either one can fire. Like one? Take them both. #2 Bribon (4-1) - Gomez and Pletcher making the third start over the oval, and is 2/2 ITM lifetime at the Spa. Stretches out to 7 panels from six, and it may be a factor. #3 Big Drama (4-1)- Eibar Coa is up, and can flash tough speed at the distance. Troubled trip last out, and seven furlongs should be no problem. This is our single…. Take #3 Quality Road, and make this the free spot. 3/3 at Saratoga ITM, and was just bested at the wire by Blame last out… There is no Blame in here today, and he is my single. This is spread out time, and it is a New York turf race that may offer value. These maidens may just make the ticket. Maragh for Tim Hills, and worked a bullet in the morning. I like the stretch out from 6 to a mile, and the trainer may do better going two turns. Leparoux up today and he is a 42% ITM turf rider. I think he has faced quicker runners in his past two starts. Dominguez and Linda Rice team up with this first timer, and gets first Lasix for good measure. You have to like the price with the connections. Castellano aboard this promising runner. He was rank and under restraint last out over the turf for the first time, and should improve in his hands. It is his second time against New York breds, and if he overcomes the post, it could be lights out. So, there is some food for thought. Be sure to check it against the tier levels, and see where you stand. The total cost of this ticket is: 4 x 3 x 1 x 4 = $48.